It’s usually the job of the player to be fighting in the arena, going up against bloodthirsty gladiators or the occasional lion. Well Domina flips the script, putting players in charge of a new gladiator school and tasking them to make it one of the greatest in Rome. For virtual career politicians, have a look at these top notch PC strategy games. Running a gladiator school isn’t just drilling your men and buying the right gladii and tridents, it requires a fair amount of political chicanery. By currying favour with notable Romans, you will raise the prestige of both your gladiator school and your family. It’s not all bread and circuses however, as you’ll have to deal with rival gladiator schools, alongside keeping your own fighters hungry and healthy for battle. Each of your gladiators can be trained in a specific fighting style, so it pays to have a decent range of warriors. From retiarii to murmillones to bestiarii, you’ll have to train up a varied stable of fighters to cater to the wavering interests of the Roman people. While you can set up special exhibition matches and choose your fighters that will enter the arena, you cannot directly control your warriors. Much like real gladiatorial games, you just have to sit back and watch as your trained killers to their best to fight. Just hope they get the thumbs up from the crowd. The arenas vary in size from brutal one on one duels to the death, to spectacular battle royales with multiple combatants. I don’t know if the infamous Naumachia is in the game somewhere, but expect plenty of bloodshed on the arena floor. 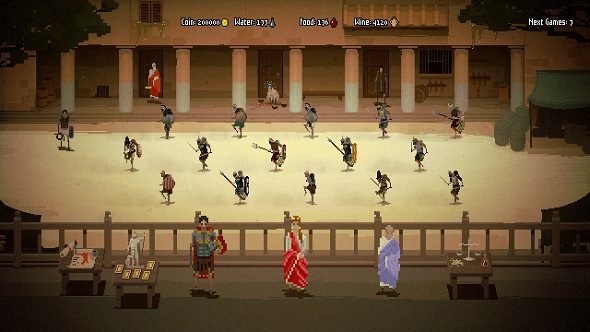 For those looking to be a Latin fight promoter, Domina is set to launch on Steam April 4.